Meandering around the Gardens in late March and Early April results in finding hidden treasures if you know how to look for them. This is the time when some of the more intriguing experiments on the property show their colors. 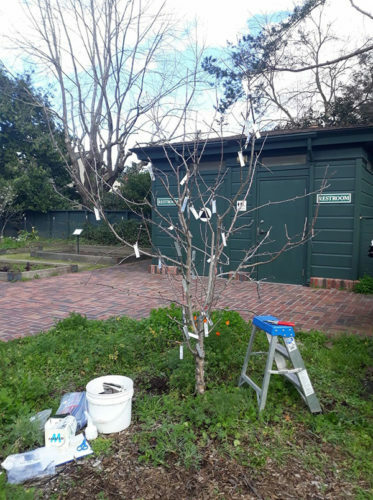 If you wander by the demonstration bed with the story about the 20,000 prune trees and look closely, you’ll see that some of the almond rootstocks have been multi-grafted. 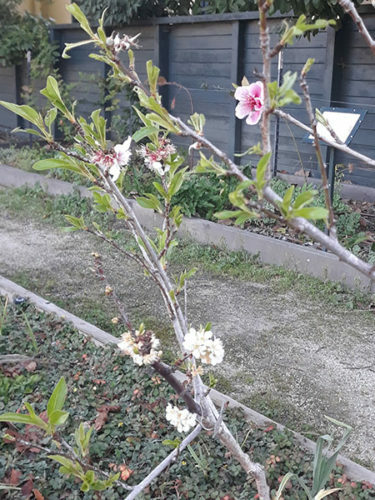 One of these little trees has a peach, a pluot, and an almond all flowering at the same time! Hopefully we’ll get to see some very different fruit forming on each of these. Another great treasure in the Gardens is our multi-grafted apple tree. This year, the little tree is home to over 50 different unique cultivars of apples!! Be sure to take a look at it as you come visit throughout April, as it should be waking up and looking intriguing. This tree is in true Burbank style, as he was an avid grafter who touted having a cherry tree with over 500 grafts on it. He often used grafting as a way to save time and space with his tree experiments. We’ve also added four cultivars of Burbank plums to the Plum Orchard including Sultan, the Rutland Plumcot, Pearl, and Elephant Heart! This brings the total number of Burbank cultivars in that section to 38. That means we are about a third of the way to having all of Burbank’s plum cultivars. We should be able to get a few more out of the USDA’s collection, and possibly a few from Goldridge as well. Luther’s multi-grafted Cherry tree at Gold Ridge in Sebastopol produced as many as 500 kinds of cherries at the same time—this for the purpose of convenient comparison and intelligent selections. — taken from the booklet Half-Hour Experiments with Plants by Luther Burbank. ’Tis the Season to Graft Your Fruit Trees!